Welcome to Booger Hollow, Arkansas! Booger Hollow Trading Post features Arkansas-crafted items in walnut and cherry woods, handmade apparel, glass, and antiques. 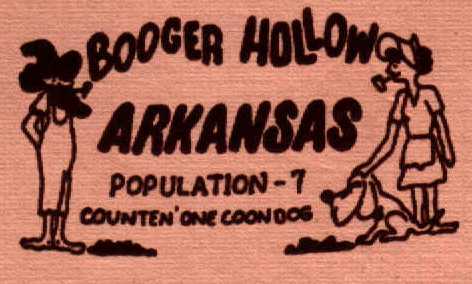 Let's step back into history a piece and find the origin of such a name as Booger Hollow. Booger derived from an old Welsh word "Bwg" which meant to scare. During the 16th century, the English gradually changed the word to "Bugg" and from this a gradual evolution to "Boo"(scary, frightening, or causing alarm) and "Bogus" - something not real. In early America, Boogie-Man was used as a threat to small children when they misbehaved. In the mountain sections this was changed to Boogie-Bear because the youngsters were more afraid of bears. The phrase finally dropped to "Booger". During the late 1800's, the road south of Harrison ran through Bull Frog Valley and Booger Hollow. There was a cemetery at each end of Booger Hollow, and the local citizens passed the word along that it was always advisable to have a companion when going through this area at night. It must have been spooky. Then, following the Civil War, it seems that quite a few unruly citizens lived close to Dover, and the govenor had to send the militia to quiet them at times. When the word got around that the milita was on the way, the citizens made thier way up to Booger Hollow to set up an ambush and bushwhacked those who attempted to go through. This is only a short background, but to have lived at that time and tried to make it through the area at night must have been a booger. Booger Hollow Trading Post was established in 1961 along the entire north section of the road. Of course, it was only natrual to to call it Booger Hollow Trading Post, beacause Booger Hollow is so close by. The fact that it is built on a mountain top instead of in a hollow only adds to the curiousity of the traveler.